Foamcore is an excellent lightweight product for framing, mounting, or simply backing in a poly bag. 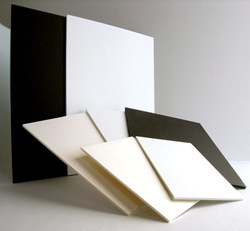 Foamcore has a solid core and is very rigid making it useful for a wide variety of projects. Slightly shiny, white finish on both sides. Comes in either 1/8 in. (3mm) or 3/16 in. (5mm). Of conservation quality. Best used with conservation mats and supplies.